Dairy intolerance can be a complex issue. 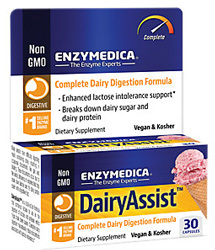 Food intolerance reactions are caused by a deficiency of digestive enzymes. When one is lactose intolerant, they are deficient of lactase, the enzyme produced by the body to break dairy sugar down into glucose, a simple sugar that can be easily absorbed. When there is not enough lactase in the digestive system to digest the amount of lactose consumed, the body retains water in the bowel. The result may be uncomfortable cramps, occasional bloating and diarrhea. Symptoms usually occur 30 minutes to two hours after ingesting dairy foods. Lactose intolerance impacts as many as 50 million Americans.1 Some causes of lactose intolerance are well known. For instance, certain digestive diseases and injuries to the small intestine can reduce the amount of enzymes produced. In rare cases, children are born without the ability to produce the enzyme lactase. For most people, however, lactase deficiency develops with age. Individuals who believe they are lactose intolerant may be reacting to the milk protein, casein. Casein is the main protein found in milk and is also used in many food products as a binding agent. The reaction for a casein intolerance is usually less severe and takes a bit more time to appear. Gastrointestinal problems, such as occasional diarrhea, bloating and abdominal cramps, are common symptoms of a food intolerance, but some people can also experience joint pain, fatigue and behavioral changes. Other Ingredients: 100% Vegetarian Capsule (cellulose, water) Contains NO egg, dairy, preservatives, salt, sucrose, soy, wheat, yeast, nuts, corn, gluten, casein, potato, rice, artificial colors or flavors.